Knoco stories: What happened when the Wright brothers stopped learning? What happened when the Wright brothers stopped learning? This is a story about the Winners' Curse - the observation that Leaders make poor Learners, often because they are unwilling to let go of the knowledge that made them leaders in the first place. The story is taken from the excellent book Profiles in Folly. The Wright brothers are not a couple that you would expect to encounter in a book about Folly. Their development of the first powered flight reads like a manual in Knowledge Management. They did meticulous research into lift, building the worlds first wind tunnel in order to devise the optimum wing profile, thereby inventing the science of aeronautics. They transferred that research into the design of the power system and the propeller, realising that the propeller was just a wing, oriented sideways. Finally they addressed the "Breakthrough concept", solving the problem of controlled flight through a solution known as "Wing Warping", which they tested extensively on unpowered gliders. They had addressed the three key areas of knowledge, and their maiden flight was almost a formality (as Wilbur wrote at the time, "“There is now no question of final success”). The rest is history. The first powered flight, the first patents on a viable flying machine, and a start at pole position in the aviation industry. Fame and fortune looked assured. 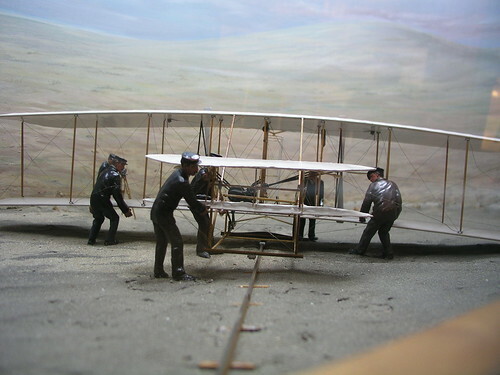 One key to the Wright brothers' initial success, and the one they were quickest to patent, had been Wing Warping - the use of levers, ropes and pulleys to twist and bend the wings in order to steer the plane. However steering an aeroplane by Wing Warping was very difficult to learn and very tricky to master, and it was far too easy to lose control. Already a better means of control was being investigated by other inventors - the use of wing ailerons; hinged flaps at the trailing edge of the wings as used in most planes today - but the Wright brothers held the patent to this idea. "The United States entered World War 1 with woefully obsolete aircraft. The Wrights stubbornly refused to abandon the wing-warping system, even after it repeatedly proved fatal. On September 17, 1908, Lt Thomas Selfridge became the first military pilot to die in a crash ..... more than 20 other aviators were killed in crashes almost certainly caused by a loss of control linked to wing warping.......Yet even after the Wrights clung to wing warping, even after they were manufacturing aircraft full-time through their own company, they stubbornly defended in court their patent right to the aileron system, discouraging others from using it for fear of suffering lawsuit. "The Wrights, who had made the greatest breakthrough in the development of aviation, then hobbled that development before finally abandoning the field altogether". The Wright brothers suffered from winners curse. Having won the race, they clung to the knowledge they had developed, even as it became obsolete as better solutions were developed, and eventually sold their company and retired. First learner advantage only remains an advantage, if the learner continues to learn. If the leader doesn't continue to learn, they don't continue to lead. The lesson is; you may be ahead of the game, you may be winning the race, but unless you continue to be open to new ideas and to continula learning you will eventually be overtaken and will lose.